Our May recipe is souffle, a light egg dish that’s perfect for what we call a “small house” — 4 to 6 guests. You may have heard of cheese souffle or some other savory version. We do a sweet twist with an orange souffle (with optional strawberry topping in season), best served warm right out of the oven all fluffy and puffy and pretty. 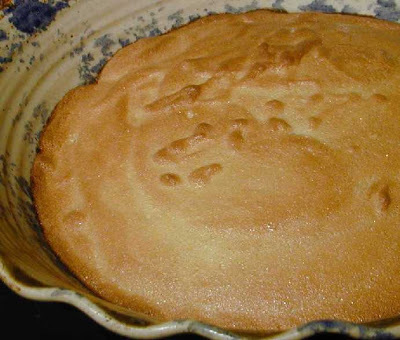 The biggest concern for those who make souffle is that the souffle will collapse before it gets to the table, due to the fact that as the souffle cools, the air inside is released, deflating the souffle. For B&Bs, presentation is a big part of breakfast, so if you want your friends and family to see your souffle at its best, we humbly share this word of advice we heard once from other innkeepers: Souffle doesn’t wait for the guests; the guests wait for the souffle. First, note that you will need a baking dish with steep sides for this recipe, or simply fill your baking dish 3/4 full with batter to allow room for the souffle to rise. In a small or medium saucepan, melt butter. Add orange juice and sugar, removing from heat when bubbly. Innkeeper Tip #1: You might want to make the sauce after you make the batter, because the sauce needs to be hot when it goes into the souffle bowl. It goes in the dish first, before the batter, which is why we list it first). Separate yolks from the egg whites. In a large bowl, beat the egg whites until foamy. Add sugar and beat until the whites hold stiff peaks. In a separate bowl, beat together the egg yolks, orange juice and flour until well mixed. Gently fold into the egg whites with a rubber spatula (emphasis on gently). Now, on to the souffle! Preheat oven to 350. Spray your baking dish’s sides with nonstick spray. Pour sauce into baking dish first. Gently slide large spoonfuls of the batter into the hot sauce. Bake for 45 minutes, until the center jiggles only slightly. In a small or medium frying pan, melt butter. Stir in sugar and orange juice. When bubbling, stir in the sliced strawberries just until warm; do not cook. Spoon over souffle before serving.